If you have a toddler and a newborn, and you are usually on the go, then the Joovy Caboose Stand-On Tandem Stroller is the double stroller for your family. 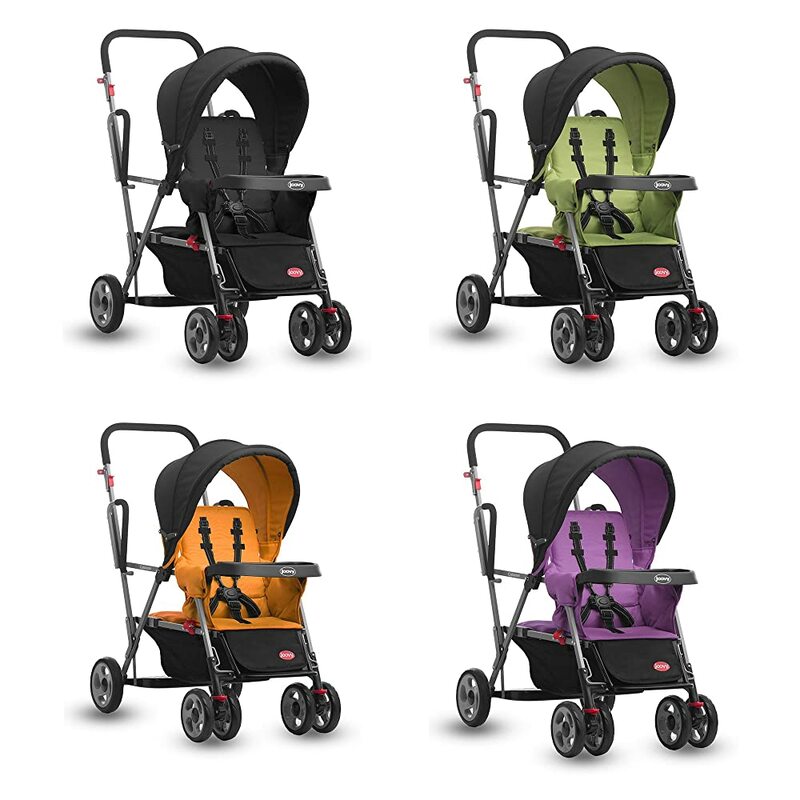 The stroller is so compact and lightweight that it can be maneuvered easily, fit doors, and fold super-flat when being transported. It is perfect and safe to use for strolling outdoors, as well as running errands in indoor establishments like supermarkets, malls and shops. It is very convenient to use that it has a universal infant car seat adaptor. The toddler on the other hand has the option to just stand-up, or to sit on the toddler bench. Because it is light, compact, and very easy to use, the Joovy Caboose Stand-On Tandem Stroller is very easy to maneuver whether outdoors, or in malls or any indoor establishments. 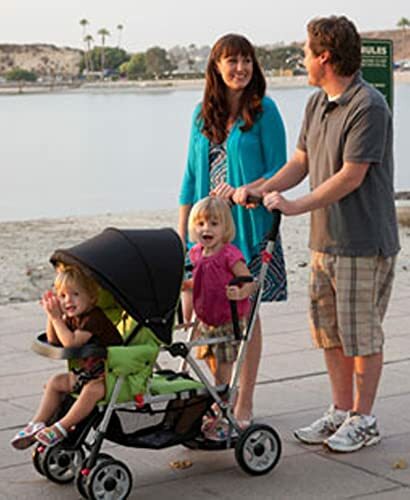 The stroller swivels easily and turns without so much effort on your part. 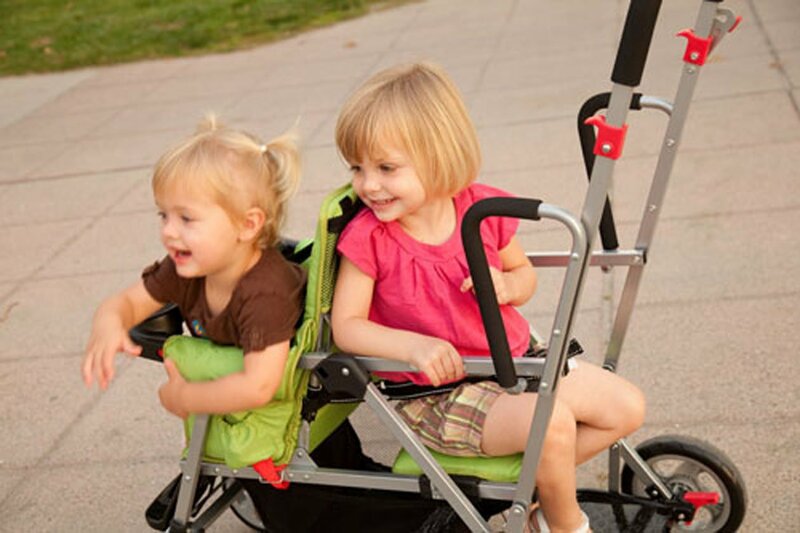 Because the older child can choose whether he would like to sit or stand while riding on the stroller, the older child will get the feeling of being older and more independent. More importantly, the parent will no longer have to carry the older child to get into the stroller because the toddler can just hop on it, and hold on to the handles if he wants to stand up while riding, or sit down in the bench. You will no longer have to worry about rousing your infant when it is time to go because you can put his car seat directly unto the stroller. The Joovy Caboose Stand On Tandem Stroller can adapt to any brand of infant car seat so you can always use your existing one so there will be no hassle or additional expense on your part! 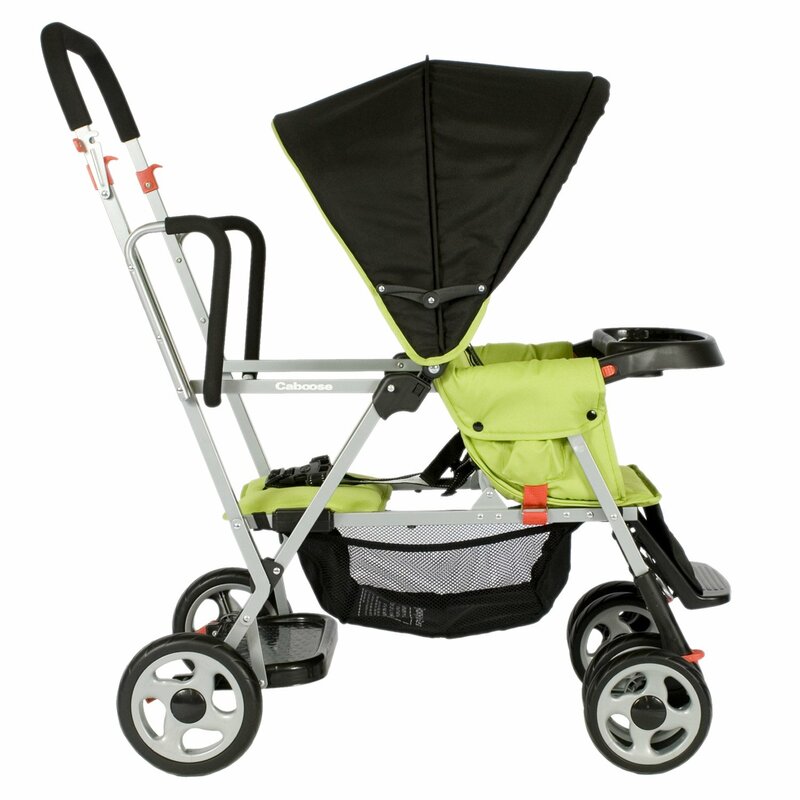 It has a trigger fold mechanism that allows you to fold up the stroller in a snap. More importantly, it lays really flat, so you can haul of more items on your vehicle’s trunk. It will also not eat up much space in your home storage. The infant seat of the stroller can fully recline, enough to allow your younger baby to nap comfortably. The toddler jump seat on the other hand is cushioned, has handles, and foot rest. Your older child can also rest his back by leaning on the back of the infant stroller. 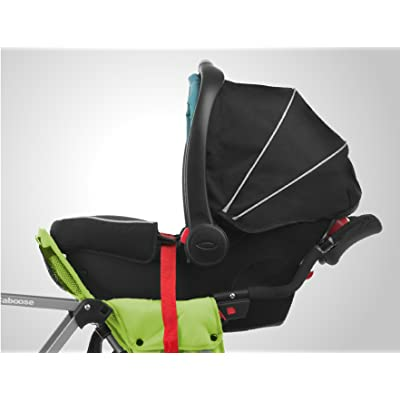 All harnesses are padded, and the canopy for the infant is enough to protect your younger child from the rays of the sun or sudden changes in the weather. Both seats can accommodate up to a 45-pound child. This tandem stroller has enough safety mechanisms to ensure a safe ride for both of your children. 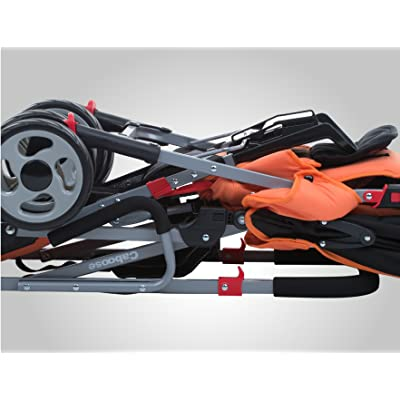 Apart from harnesses, there are easy to operate breaking mechanisms to stop the stroller from moving, or ensure that it stays steady when you are not mobile. 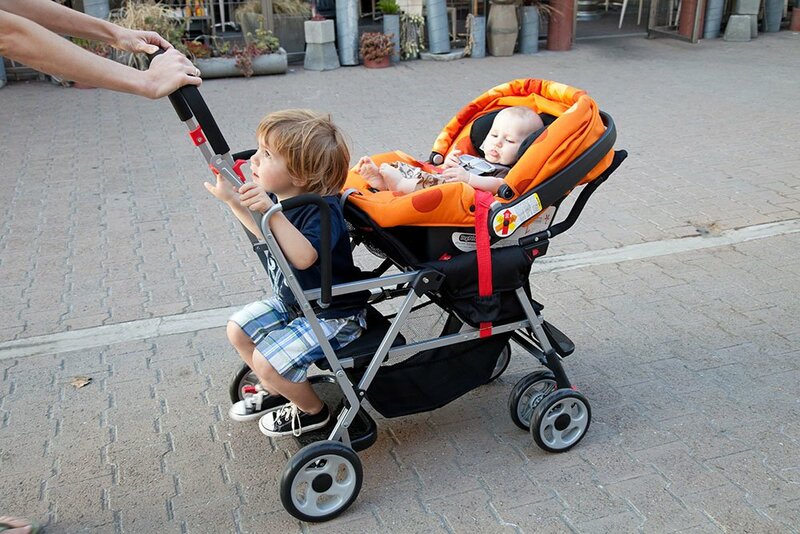 High Parent handle: The handle bars are high enough to provide utmost convenience for parents, and ensure that your older child will not bump his head on it whenever he is about to ride on the stroller. Great Storage: It has enough storage for the parents. The under-seat basket is big enough to accommodate a diaper bag that is large enough to contain the stuff needed by the two children. It also has back pockets, as well as cup holders and a tray for the kid’s bottles, sippy cups or snacks. 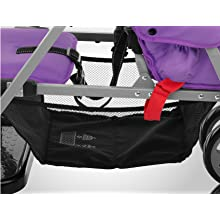 Very convenient to use: Folds up quick and fast, and does not eat up a lot of storage space compared to other tandem strollers. It also has a universal adapter for all brands of infant car seats. It is super lightweight too! 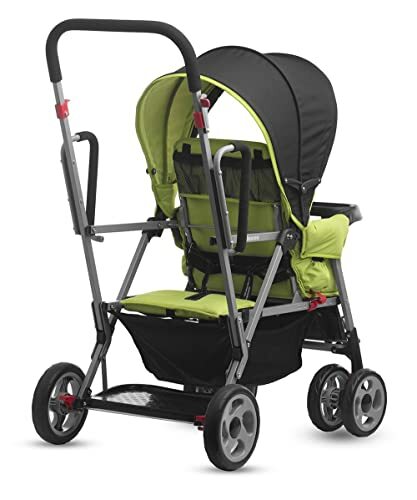 Sturdy and Durable: This stroller is meant to last because it is made of materials that are enough to withstand the full capacity of the stroller without affecting its maneuverability and over-all performance. Easy to Clean: You will not have problems when it comes to keeping this stroller clean. The hard plastic parts are very easy to wipe and disinfect, while the fabric parts are easy to spot clean because it is made of nylon. No Recline option for the older child: While it encourages independence on your older child, your toddler will not be able to nap on it. This is of course the disadvantage of sit-and-stand strollers. No canopy for the older child: Should there be a sudden change of weather like sudden drizzle or rains, your older child will not be protected from it because the jump seat for the toddler does not come with a canopy. This is also the case when it is super sunny. No shade for your older child. Not Manufactured in the United States: Like most strollers in the market today, this tandem stroller is not manufactured in the USA. If that is an issue with you then it becomes one of the disadvantages of buying this stroller. 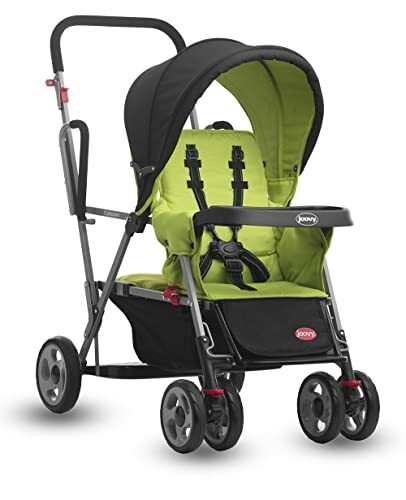 If you are in search of a super convenient, light weight, and compact double stroller, then the Joovy Caboose Stand-On Tandem Stroller, is the best stroller for your older child and your young infant. The universal infant car seat adapter, the high handle bars, the easy trigger folding mechanisms, and adequate storage makes it one of the best options that you have in the market today. Add more points for very easy maneuverability, as it can easily make turns, very light to push, and fit all doors. on of the best double stroller you may love baby trend sit n stand double. Be sure to check this one out ! « When is the right time to take your baby out ?